This page gathers the tool links and the user manuals for each of the tools developed in the context of the Gazelle project. If you want to install your own instance of one of those tools, consult our Installation guide. If you want to learn more about the Gazelle purposes and achitecture, read the Gazelle general information page. Audit Message Validator Embedded in Gazelle Security Suite, it offers a web service to validate the ATNA messages produced in the context of IHE. 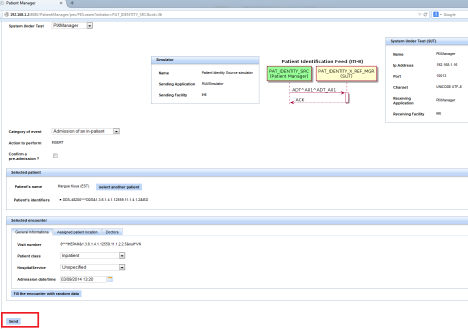 XUA validator Embedded in GSS, it offers a web service to validate SAML assertions for the profile XUA. Simulators are tools which emulated an IHE actor in order to allow user to test their products against an implementation of the technical framework. There are not reference implementation. Read the short introduction to simulators. Gazelle is a test bed for testing the interoperability of eHealth systems. It is developed by IHE Europe with the support of several other IHE countries (USA, Japan, Korea, Australia). The development was initiated in 2006 with a team of developers at INRIA and continued with the team moving to Kereval. The development of the Gazelle Test Bed is the second generation of Test Management tooling that IHE developed. In 2006 with the growth in the number of participant to the connectathon, it became clear that the tool had to move to a more robust platform in order to support the load and the scalability of a large project. The choice of Java and Jboss was then made and a development team was established at INRIA Rennes. In 2011 the Gazelle Test Bed project reached maturity and it was decided to move the development team to a company specialized in testing (Kereval in Rennes) in order to offer a more robust software development environment and deploy a quality management compatible with the certification requirement of ISO 17025 and Guide 65. Gazelle Test Bed is using a Service Oriented Architecture (SOA). The following figure shows the different component of the test bed. It consists of simulators, validation tools, data generation tools, a proxy and a test management tool. click on the image to get an interactived view of the architecture ! As Gazelle is made of different webapps, it is necessary to share the authentication of the users among the different component. To achieve that goal, SSO (Single Sign On) is used. When a user access a protected resource, the application validates its identity. If the user is not authenticated, it routes him to a shared application managing identities. When the user gets his credentials, he gives his ticket to the source application. That one checks against the SSO that the ticket is valid and authenticates him. Therefore, user identities are shared among all applications. Gazelle CAS uses EU-CAT user database. Gazelle is using Jasig CAS for SSO, feating perfectly all our needs. Applications have to be modified a bit to replace current authentication without too much effort. However, Gazelle applications should be able to use or not the SSO. For Test Management and Product Registry, SSO can be enabled at runtime. Gazelle's SSO is able to authenticate users using a X.509 browser certificate. As described in this page, Gazelle SSO supports authentication using X.509 certificates. The CAS server asks the browser for a certificate proving identity. Process is seamless and allows magic login on Gazelle applications. If you are using Firefox, you can import CA certificate directly by clicking the first link. Otherwise, you have to download the PEM located here and install it in your browser. You can also install an authentication certificate in your browser by clicking on "Compute certificate". Using this, you will not have to enter your login/password each time. C:\Program Files\Java\jdk1.6.0_26>.\jre\bin\keytool -keystore .\jre\lib\security\cacerts -storepass changeit -import -trustcacerts -v -alias ihe2 -file "C:\643.pem"
3. Start or restart your JBoss AS. Nonconformity of healthcare implementations to the medical standards has become a real source of troubles and loss of interoperability between systems. Healthcare documents frequently contain inconsistent requirements related to the standards they must conform to. Few standards and methodologies exist to deal with complex requirements, and often they are only dedicated to some specific kinds of healthcare standards, like CDA, HL7 and DICOM. The complexity of standards and their constant evolution have made difficult theimplementation of robust check methods and tools for healthcare documents. Presentation in Lisbon eHealth Week in December 2015 : https://gazelle.ihe.net/files/20151209-Art-decor_and_Gazelle_tools-Lisbon.pdf, here the context of the presentation. KEREVAL Health Lab, on behalf of IHE Europe, has developed a tool to create validator for XML documents related to IHE specifications. This validator tool can be used to validate any kind of XML document, especially CDA documents. The aim of the tool is to transform assertions of standards into an UML models with constraints into it, and then create from this model Java code of validation of CDA documents, a documentation and unit testing of theses constraints. Gazelle Objects Checker is not a CDA Authoring Tool. For authoring of CDA documents we recommend to use Art-Decor. Gazelle Objects Checker can be interfaced with authoring tools and import the definition of CDA document. The principle of this project is to extract assertions from CDA specifications and to insert them into a UML model. This model is then processed to generate validator, unit testing and documentation. Numerous regional and national healthcare initiatives are requiring eHealth applications to be tested for conformance to profiled standards. Meaningful Use (Melissa Markey, 2012) in the USA, Elga (Georg Duftschmid, 2009) in Austria or ASIP (ASIP, 2012a) in France illustrate the desire of healthcare organizations to build an infrastructure to share PHR. Most of those initiatives are profiling the HL7 CDA (HL7, 2005a) standards and/or the IHE XDS (IHE, 2012a) profiles specifications. CDA specifies how tostructure and code health records while XDS providesthe sharing mechanism of these records. Testing the conformance of healthcare solutions becomes an important issue in order to achieve the interoperability of the different components contributing to the sharing of such documents. Since both XD messages and CDA documents have an XML structure, we have developed a methodology that allows the conformance checking of XML documents in the context of hybrid healthcare standards. This methodology is based on UML modeling and MDA approach to describe the specifications. The main idea of this methodology is to inject constraints into UML models instead of executing xpath rules into XML documents. The result of this methodology is a report of validation generated automatically from the models describing the healthcare standards. Following a review of existing solutions for validating XML documents in the field of healthcare we will present our methodology and its evaluation based on its use on real life project like epSOS (Thorp, 2010) (epSOS, 2013). Our goal is to create a method that allows describing formally all requirements under an XML healthcare standard. This method should be generic and support inheritance between standards. The performance of this method shall be comparable to the performance of schematrons, and even better. This method shall provide a documentation and a coverage of the implemented requirements. The maintainability of the tools and models shall be better than schematrons maintainability. The method described here provide also generated unit testing for each implemented requirement, which is a huge advantage comparing to schematrons. The outcome of the proposed methodology is to provide a UML model and a set of methods used to convert it into documentation, validators and test procedures (Hans-Erik Erikson, 2004). We can point as example two standards that share the same basic parent standards, and extend them with more rules and requirements. These standards are the Swiss CDA Laboratory documents (eHealth Suisse, 2013), and the French CDA Laboratory documents (ASIP, 2012b). These two kinds of documents are based on the standards below, described on the figure 1. The two standards have a common base, and differ only on the top of the pyramid of standards. The method described here takes care of this kind of inheritance, and allows having shared models for shared standards. From medical standards like HL7, DICOM (Hongli Lin, 2010) and IHE standards, we extract all requirements, and we insert them into a specific UML model, which has a specific structure, that we will describe later. The UML model contains constraints written in OCL (Object Constraint Language) (OMG, 2012). The purpose of this language is to describe the relationship between elements of the UML model, which can not be simply described by diagrammatic notation. Each OCL constraint represents a requirement on a medical standard. OCL is a powerful language that permits many variants of constraints, like loops, search constraints, conditional constraints, etc. By our experience on more than 50 validators of IHE documents, OCL can generate the description of any kind of rules related to the model. The created UML model contains also the structure of the XML document. This structure allows linking the OCL constraint to its corresponding XML element. The OCL constraints are then processed to a programming language code like JAVA. In the industry, there are many processors of OCL. The most popular one is DresdenOCL, which is a library developed and maintained by students and scientists of the Software Technology Group at Dresden University of Technology (Birgit Demuth, 2009) (Birgit Demuth and Zschale, 2004). 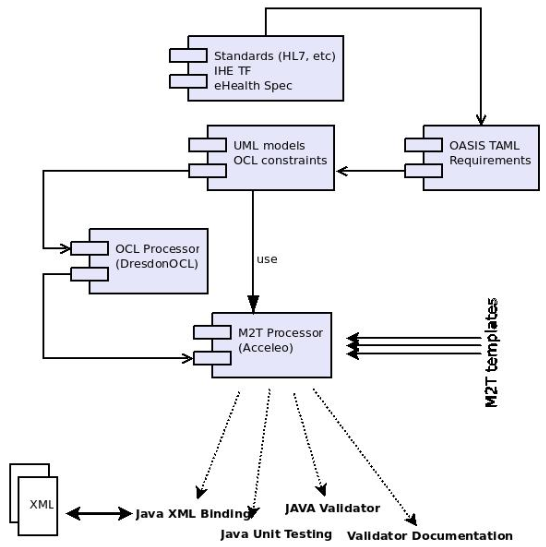 The UML models and the processed OCL constraints are then used by a UML model to text generator (M2T), to generate a specific validator based on the UML contents (OMG, 2008). There are many projects that present themselves as a UML model to text tool, the most popular one is Acceleo (OMG, 2008). Acceleo is not a classic generator of code from UML models, like EMF generator. To generate code you have to provide some M2T templates, which describe the generated text from the model. The generated text can be of any kind: html, java, or C++ for example. The idea was to generate java code that allows transforming the XML document to be validated from XML to JAVA instances, and then to validate these java instances by using the code generated by the OCL processor. The M2T method allows also to generate a documentation of the UML model, and unit tests for constraints written on OCL. Each module is described by its M2T templates. Requirements on healthcare documents are generally written on human language, not a formal one. A major problem of the maintainability of schematrons was the fact that once the schematron written, we do not know which requirements are described on it, and which ones are not. We have no information about the coverage of rules written on schematrons, according to requirements from healthcare specifications. Many tools offer the possibility to list requirements, like TestLink for example. The one that we chose was an OASIS standard: taml (OASIS, 2011). This standard is a common structure for defining requirements. We used this standard and restricted its structure to better conform to the context of requirements on healthcare documents. This standard allows specifying the list of predicates, and for each predicate you can specify a list of tags which describe the predicate. We restricted the tags to: ’section’ and ’page’, which describe the section on the document and the page that refer to the requirement. Each predicate is defined by a unique identifier (/taml:testAssertion/@id), and each list of requirements is defined by a unique identifier: /testAssertionSet/common/normativeSource/target/@idscheme. Each requirement is identified by a unique couple (target@idscheme , testAssertion@id). So we defined a stereotype applied on UML constraint elements, which describes the relationship between constraints and requirements. It contains two attributes: IDs and targetIDScheme, where IDs represents the list of ID on the taml document, and targetIDScheme is the identifier of the taml document. This correlation between constraints and requirements allows calculating the coverage of the validator according to the list of requirements, and then to identify requirements that are not implemented in the UML models. The OCL constraint shall always have the result equals to true when applied to an UML instance specification. On healthcare standards, especially on HL7 ones, there are three kinds of rules: requirements, warning, and notes, which are specified by the keyword SHALL, SHOULD and MAY (Bradner, 1997). We specified a stereotype applied on UML constraint elements, which allows to specify if the constraint is an error, a warning, or a note. This stereotype is named ConstraintType. We defined also a stereotype to document a constraint when it is related to a valueSet: a dynamic list of values, that can be provided by a CTS or a SVS provider (IHE, 2010) (HL7, 2005b) (Heymans S, 2011). Each created constraint element shall be related to a UML class element. There are two kinds of UML classes in this methodology: classes used to describe the content of the XML document, and classes used to apply a list of rules on a kind of XML element. Classes used to describe the content of the XML document: These classes, called in our specification StructureClass (SC), contain attributes with the same structure described in the schema of the XML document. The profile used to describe the relation between classes and the schema elements is ’Ecore’ profile (Dave Steinberg, 2008). From an XSD we can generate the UML model containing the description of the content of the XML document. The principal stereotypes used from this profile to describe the XML structure are: EPackage, Eclass, EEnum, EAttribute, and EReference. The generation of code binded to XML is based on these stereotypes. On this kind of classes, basic constraints can be included. If we are sure that a rule shall be applicable to any restriction of the standard, and it is not related to some specific context, we can add it directly on the class of description of the element. Classes used to apply rules on a kind of XML element: When we are on a special specification of a standard, or on an affinity domain which restrict the original standard, like for example epSOS CDA standard, we know that rules applied by these standards are not absolute, and we can not attach these rules directly to the class of description of the element. We defined the notion of ’package of constraints’. Each package of constraints contains a list of classes of constraints, and each class of constraints contains a list of constraints, has a generalization to the parent UML StructureClass or to another class of constraints, and has a stereotype that defines the kind of the class of constraints. AdvancedTemplate (AT): defined by an OCL rule. The list of constraints on this kind of classes is applied only when the specified rule is verified on an instance of the parent class. The UML classes that are described by these stereotypes are created manually in the UML model, in order to provide restrictions on the StructureClass (SC) classes, using UML constraints that describe requirements of the specifications. However, the StructureClass(SC) classes are created automatically from the XSD schema that describes the structure of the XML documents to be validated (R. Bhuvaneswari, 2012). This schema is generally provided by the standard specification. The mixing of these kinds of classes of constraints can lead us to illogic situations, by generalization from one kind to another. So we defined some rules of inheritance between Template Spec (TS), ConstraintsSpec (CS), AdvancedTemplate (AT) and StructureClass (SC). When a class of constraints generalizes another class of constraints, parent class rules are added to the child class rules, and the two lists of rules are executed only if we can execute the two lists in the same time. If we allow a TemplateSpec to inherit from another TemplateSpec, the rules of the child are executed only if the element tested on the XML document verifies the two paths of the parent and the child classes. If one of these paths is not verified, the rules are not executed, and here we have a problem because no error is reported to the designer of the XML document, showing that the XML element is missing a path, one or the other. For this reason, the table below specifies this kind of relationship between classes of constraints. We also defined a stereotype to document classes of constraints, named DocumentationSpec. It allows specifying information about the standard which is the origin of constraints, and this provides a better documentation of the class of constraints when generating the documentation of the model of constraints. As explained on the principle of this method, as output we need to generate a code that allows transforming XML elements to object instances. In the implementation of this methodology, we chose JAXB as the API to bind XML to objects (McLaughlin, 2002). Oracle provides a tool, named xjc (McLaughlin, 2001), which allows to generate from an XML schema, java classes containing a full description of the XSD elements, based on JAXB annotations. The same functionality of generation of code containing a binding with XSD elements is done by a M2T template. Creating our own generator of java code gives us the possibility to add further methods and attributes, that are not generated by xjc. For example, we have introduced the ability to validate xpath constraints as a method of validation on the generated java code. 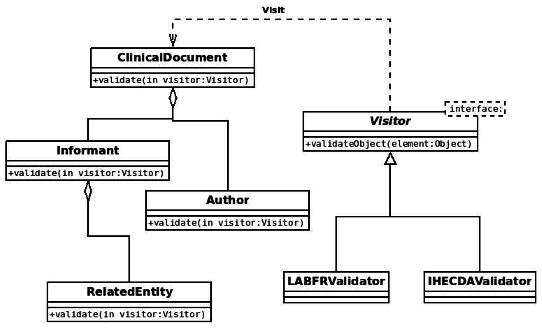 The second kind of output from UML models is the classes of validation. This generated code is the combination of the OCL code transformed and processed by the OCL processor, and the generated code from a M2T template that links rules between themselves. The result of the execution of the generated code is a list of verifications. This list contains errors, warnings, notes and reports about processing of rules. For each package of classes of constraints, we generate a class of validation. This technique allows the reusability of the generated code, and simplifies the imbrication of standards. For example, in the laboratory domain described in figure 1, for each block in the two pyramids, we define a package of constraints. So for each of HL7 CDA, IHE PCC and XD-LAB, we define a unique package of validation. Then we define specific packages for CDA-FR, CDA-CH, and LAB-FR, LAB-CH. The validator is the combination of the common packages and the specific packages. The M2T templates generate code based on the visitor pattern: for each element on the object structure generated to describe the elements of the XML, we pass an instance of the package of validation, to a method generated from the template of generation of structured classes. This method verifies the rules of the package on the current instances, and calls the same method on its attributes with the same package’s instance. The generation of unit tests is managed by a M2T template to facilitate the process of unit testing. This feature does not exist on the schematrons’ process. The generated code provides for each constraint, two tests: one OK and one KO. The principle of each test is to validate a whole document, and to verify if the result of the constraint is what it is supposed to be. The specification of the XML documents to be verified can not be done automatically; it is the role of the tester to provide them. As we define a structure of templates and advanced templates, the specified model of constraints provides an overview of the complexity of the XML document. This feature is very useful in CDA documents and in XDS metadatas analysis, as the specifications of these kinds of documents are based on templates structure. For example, in CDA documents, sections and entries have an attribute named templateId which is a unique identifier of the kind of the element, and it is referenced by the TemplateSpec stereotype (HL7, 2005a). the documentation of the structure of the XML document: this documentation is a description of the elements of the XML document. For each element we can document the cardinality, the type, the name, and the parent. the documentation of classes of constraints: this documentation contains the relationship between constraints and classes, documentation of the kind of constraints and the kind of classes of constraints, and finally a documentation of the link between constraints and taml assertions. We designed, Gazelle ObjectsChecker, a methodology of validation of XML documents on healthcare standards based on model based architecture. This methodology has allowed to remain with weaknesses of schematrons technology, especially problems of maintainability, reusability, unit testing, documentation and requirements coverage. It has also simplified the validation of pyramidical standards. The implementation of this methodology was done using open source tools, especially Topcased as editor, DresdenOCL as OCL processor, and Acceleo as M2T generator. The generated output code was on Java technology. The result of this implementation has covered the needs of developers and users of the generated validators. The use of this methodology to create validators for multiple kinds of healthcare standards in many domains like epSOS and IHE has proved the efficiency of this method: any kind of constraint can be expressed. And also, an important feature was, the model based validators are quicker than schematrons. Several improvements could be injected into this methodology and its implementation, like a self editor of the UML model, to simplify the creation and the management of classes and constraints. 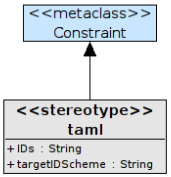 Also, the concept of stereotypes to describe classes and constraints can evolve to a meta-model that describes this set of stereotypes, and a use of GMF can improve the usability and minimize the risk of inconsistencies of UML models. Moreover, the model based validation of XML based healthcare standards could be adapted to other domains that use the XML technology. 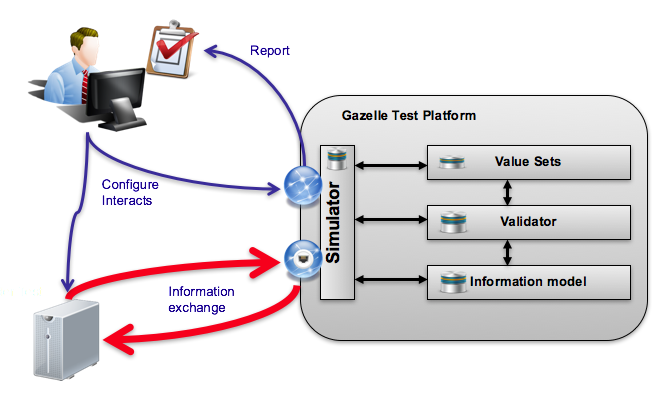 Gazelle testbed also offers applications known as simulators. Those tools implement IHE actors and exchange data with systems under test in the context of IHE transactions. Available online all year long, you can use our simulators to test the IHE interfaces of your systems off the connectathon periods. Using those tools, you will also be able to check the conformance of the messages issued by your system; actually, the simulators are configured to call the validation services offered by Gazelle. When you are testing against one of the Gazelle simulators, you are exchanging messages over the Internet. In order to ensure that your system will be able to communicate with our tools, please make sure that your firewall settings enable Gazelle to access to your system and that you have provided Gazelle with a public IP address. Read more about IPv4 networking consideration in Wikipedia. As a reminder, this is the list of private ranges of IP addresses, the ones that Gazelle is not able to reach. 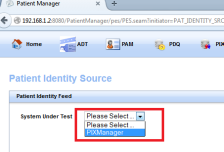 Order Manager : The intent of the Order Manager is to manage Orders and Dicom Worklist generation for testing purposes. Patient Manager : The Patient Manager tool emulates the actor/profiles dedicated to the management of the patient demographics and visits within the hospital. Gazelle communicates with the simulators using web services calls. A simulator thus needs to expose some specific webservice API. The API allow gazelle to inform the simulator of the test instance participants and to provide relevant participants configuration to the simulator and to ask the simulator about feedback of the message exchanged between the simulator and the other test participants. All simulators should have the method startTestInstance, to create a new interaction between the simulator and a system under test. After establishing a communication with the simulator, gazelle sent configuration of partners of the simulator on the test using another web service method: setTestPartenerConfiguration. If the simulator is an initiator, gazelle use the web service method sendMessage to force the simulator to execute the test. First of all, note that, like the other applications from Gazelle testing platform, the HMW Simulator is linked to our CAS service. That means that, if you have an account created in Gazelle, you can use it, if you do not have one, you can create one now by filling the form here. Create an account in Gazelle is free. The login link ("cas login") is located in the top right corner of the page. Be careful, you must be logged in order to use the HMW Simulator. In order to proceed, go to "System Configurations" and hit the "Create a Configuration" button. You can also copy or Edit an existing configuration (one of yours !). 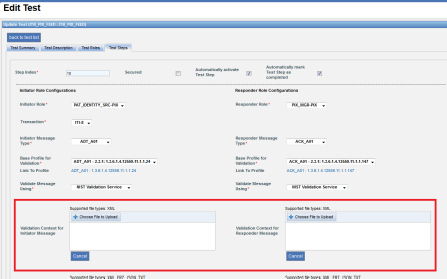 If you are logged in when creating the configuration, you will be set as the owner of the configuration. If you do not want other testers to send messages to your SUT you can uncheck the box "Do you want this configuration to be public?" and you will be the only one to be able to select your system in the drop-down list and to edit it (if logged in!). Before sending messages to your system under test, ensure that your firewall options give to HMW Simulator the access to your system. More than a big simulator for all actors acting in the HMW Supplement, the HMW Simulator simulates a typical workflow concerning the prescription, dispensing, distribution and administration of medication. What does it means for the user ? After to have enter your SUT configuration, you must create your own workflow setup. Each workflow setup will be linked to your gazelle account. So, you will be the only one to allow to modify your workflow setup. To create a new workflow setup, go to the workflow setup menu, enter the name of your workflow setup and configure each actors singly, below the sequence diagram. For each actors, you can decide to simulate this actor and choose the charset that you desire to use, OR select your SUT configuration in order to test your SUT. For example, if you want to test your Medication Dispenser actor, you will simulate the Prescription Placer, Pharmaceutical Adviser and the Administration Informer actors. Of course, you can have more than one SUT actor per workflow setup (with a maximum of three SUT). About the color of the actor panel configuration header, the green means that the actor will be simulated, and the blue means the actor will be not simulated. Soon as your workflow setup is ready, you can go to the next part and begin to use the HMW Simulator. You have the possibility to visualize or edit an existing Workflow Setup which has been created. For that, select, in the top of the page, the option "Visualize/Edit an existing Workflow Setup". Then, choose, among the available list, the workflow configuration that you desire. You can edit as you want the different actors configuration. Don't forget to save it. In the menu of the HMW Simulator, you can find the "simulators" label, which contains the access to the fourth actors define in the HMW TF supplement. When you hit one of this actor, you will arrive in the front page of the selected actor. The only action that you can do at this moment, it is to choose a Workflow configuration to work with it. A sequence diagram resumes the transaction(s) where the selected actor acts as an initiator. In the selected workflow setup, the selected actor is not simulated, it is your SUT. So you will see only the resume of the workflow setup configuration just below the sequence diagram. In the selected workflow setup, the selected actor is simulated. So you will have different pannels below the configuration resume. The first is here to show you all action that you can do with the selected actor. The second shows all HL7 messages that the selected actor has send and received from the other actors. (see "HL7 messages validation"). In using the HMW Simulator, you should see that the prescription items can be highlighted with different colors. Theses colors are the reflection of the prescription item status. White color : The prescription item just has been created and is waiting for validation. Green color : The prescription item has been validated by the Pharmaceutical Adviser actor. Blue color : The medication linked to the prescription item has been dispensed, and the Medication Preparation Report has been sent by the Medication Dispenser actor. Purple color : The medication linked to the prescription item has been administered, and the Administration Report has been sent by the Aministration Informer actor. Red color : The prescription item has been canceled, either by a discontinuation order, or by a replacement order. If you decide to simulate the Prescription Placer actor, you will be able to access, to the Prescription Placer front page, see the tab below, which group all available action for the Prescription Placer actor. In this section, we will see how to create and send a new Prescription Order to the other actors. First, choose, in the "Request Type" list : "New Order". You can see that the level of prescription encoding is : "Encoded Medication" by default and can't be changed at this moment (see the HMW TF Supplement part 5.6.4.1.2). It will be possible in further version of this simulator. At last, the "Advance Prescription Notification" option can be ticked or not. Please see the HMW TF Supplement, part 4.2 for more details about this option. You can either generate a new patient information or select an existing patient with the button in the Action column. Some filters are available in the header of the Patient data table, to make the patient search easier. The basic information about your selected patient will be display just below the Available Patient data table. Once your patient has been selected, you must select the medication(s) that you desire put in your prescription. Hit the "Select the medication(s) to prescribe to the patient..." button to go to the Medication Information tab panel. Use the action button to add a medication to your prescription and the button to delete it. The medication list of your selected medication(s) appear below the medication table. Use the button next to the "Selected Medication" title to empty the entire list. As for the Patient data table, the Medication data table allows you to use the filter, locate in the data table header, to search a specific medication. To go to the next step, hit the "Go to the prescription item(s) configuration page..." button. In this tab panel, you will be able to configure some information linked to each prescription item (if you don't remember what is a prescription item, go to the end of this part). You can come back to the previous tab panel when you want, to add or remove a medication or select an other patient for example. When your have finish the creation of your prescription, hit the "Send Prescription" button to send the New Prescription Order to the other(s) actor(s). In order to see the HL7 messages sent, go to see the last panel named : "Messages send and received by the Prescription Placer Actor. ", at the end of the page. (Don't forget : "One Prescription Order will be related to one patient, and may refer to a particular encounter (visit). It will contain one prescription, and this prescription refers one prescriber, and contains zero or more prescription items. A prescription item contains one medication item and zero or more observations." cf HMW TF Supplement part ). For the moment, only the Prescription Placer simulator allows to send a discontinuation order. This will be available for the Pharmaceutical Adviser simulator too in a future version of the HMW Simulator. Always in the Prescription Placer actor page, if you desire discontinue a Prescription Order, select, in the "Request Type" List, the value : "Discontinuation". Then, hit the button to select the prescription where the prescription item to discontinue is located. You will see the Prescription Table Over. This Table shows all Prescription Order sent by the Prescription Placer simulator. Each lines of this table represents one Prescription. The medication list, is linked to the prescription item list. Thereby, in this example, for the first prescription (with the identifier "11^IHE_HMW_PP..."), the mirtazapine medication corresponds to the precription item with the placer order number : "29^IHE_HMW_PP...". You can see, that for the second prescription, some prescription item are highlighted with a specific color. See the "Prescription Item Color highlighting" part of this tutorial for more information. About the Prescription Status, see the HMW TF Supplement part 4.5.1. Now, you can select the prescription item to discontinue. Be careful, you can discontinue only one item at a time. Hit the buttons to change the status of the pescription item. the item won't be changed. the itm will be discontinued. When your choice is made, hit the "Send Discontinuation Order" to send the discontinuation order to the Pharmaceutical Adviser actor. 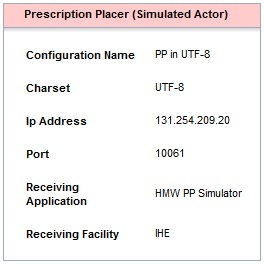 After to have send the discontinuation order, the HMW Simulator modifies the prescription item status to "P9". For the moment, only the Prescription Placer simulator allows to send a replacement order. This will be available for the Pharmaceutical Adviser simulator too in a future version of the HMW Simulator. 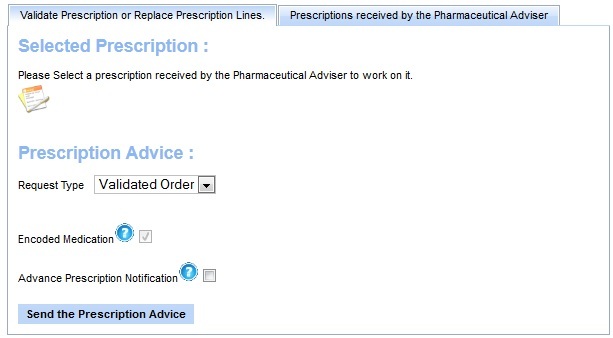 Always in the Prescription Placer actor page, if you desire replace a Prescription Order, select, in the "Request Type" List, the value : "Replacement". Then, hit the button to select the prescription where the prescription item to replace is located. As for the discontinuation order, select one prescription to work on it. Once the prescription selected, you will choose the prescription item to replace. For that, hit the button , in the Action column. You will be able to edit some information about the prescription item that you want to replace. The first panel shows you the information of the old prescription item, the item that is to be replace. The second panel shows you the information of the new item. Of course, you can change the medication linked to this prescription item, just need to hit the button . As soon as you want to send your replacement order, just hit the "Send Replacement Order" button. After to have send the replacement order, the HMW Simulator modifies the status of the old prescription item to "P9" (in this example, this is the prescription item with the placer order number "33^IHE_HMW..."). And the new prescription item (in this example, this is the item with the placer order number "36^IHE_HMW...") takes the place of the old prescription item. 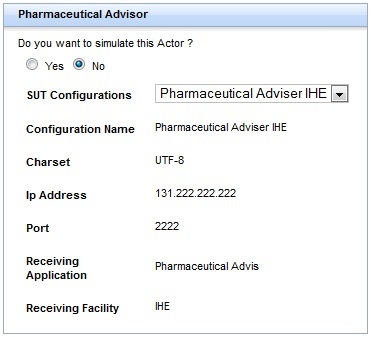 If you decided to simulate the Pahrmaceutical Adviser actor, you will be able to access, to the Pharmaceutical Adviser page, see the tab below, which group all available action for the Pharmaceutical Adviser actor. In this section, we will see how to send a Validated Order to the other actors. First, choose, in the "Request Type" list : "Validated Order". At last, the "Validated Order Confirmation" option can be ticked or not. Please see the HMW TF Supplement, part 4.2 for more details about this option. Now that you have chosen your request type, you must select a Prescription. To do that, hit this button . You will enter to the Prescription tab panel below. Then, hit the button to select the prescription to validate. You will see the Prescription Table Over. This Table shows all Prescription Order sent by the Prescription Placer simulator. Each lines of this table represents one Prescription. The medication list, is linked to the prescription item list. Thereby, in this example, for the first prescription (with the identifier "1^IHE_HMW_PP..."), the Visine medication corresponds to the precription item with the placer order number : "4^IHE_HMW_PP...". You can see, that some prescription item are highlighted with a specific color. See the "Prescription Item Color highlighting" part of this tutorial for more information. Now, you can select the prescription item to validate. You can validate all item of a prescription at a time, or only some. Hit the buttons to validate or not the pescription item. When your choice is made, hit the "Send the Prescription Advice" button to send the validation order to the other actors. the prescription item will be validated. the prescription item won't be validated. 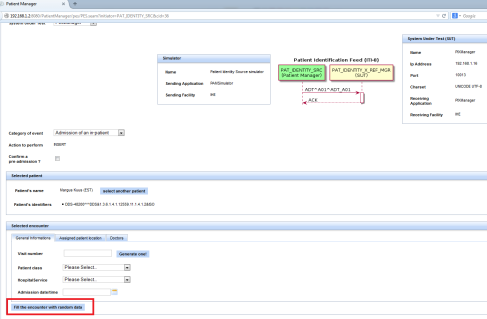 After to have send the validation order, the HMW Simulator modifies the prescription item status to "V3". 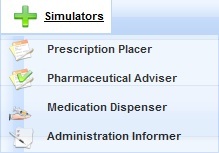 If you decided to simulate the Medication Dispenser actor, you will be able to access, to the Dispenser actor page. In this section, we will see how to send a Medication Preparation Report Order to the other actors. Now, you must select a Prescription to work on it. To do that, hit this button . You will enter to the Prescription tab panel below. Then, hit the button to select the prescription to dispense. You will see the Prescription Table Over. This Table shows all Prescription Order sent by the Prescription Placer simulator. Each lines of this table represents one Prescription. The medication list, is linked to the prescription item list. Thereby, in this example, for the first prescription (with the identifier "3^IHE_HMW_PP..."), the Visine medication corresponds to the precription item with the placer order number : "5^IHE_HMW_PP...". Now, you can select the prescription item(s) to send the Medication Preparation Report. You can dispense all item of a prescription at a time, or only some. Hit the buttons to dispense or not the pescription item. When your choice is made, hit the "Send theMedication Preparation Report" button to send the medication preparation report order to the other actors. the prescription item will be dispensed. the prescription item won't be dispensed. After to have send the medication preparation report order, the HMW Simulator modifies the prescription item status to "D3". If you decided to simulate the Administration Informer actor, you will be able to access, to the Administration Informer page, see the tab below, which group all available action or the Administration Informer. In this section, we will see how to send a new Administration Report Order to the other actors. First, choose, in the "Request Type" list : "New administration Report". Now that you have chosen your request type, you must select a Prescription to begin. To do that, hit this button . You will enter to the Prescription tab panel below. Then, hit the button to select the prescription to validate. Now, you can select the prescription item to administer. You can administer all item of a prescription at a time, or only some. Hit the buttons to administer or not the pescription item. When your choice is made, hit the "Send Administration Report" button to send the administration report order to the other actors. the prescription item will be administered. the prescription item won't be administered. After to have send the administration report order, the HMW Simulator modifies the prescription item status to "A3". 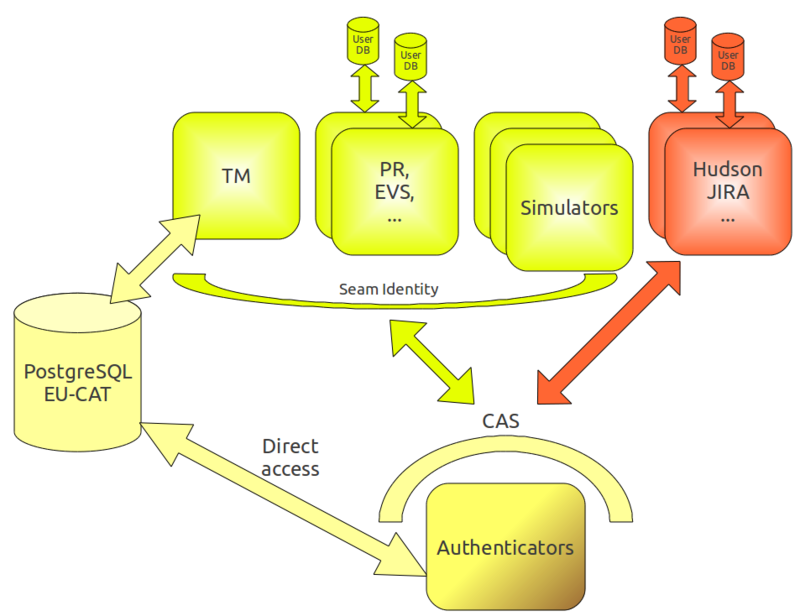 The LCSD simulator can help testing applications implementing the Code Set Master and/or the Code Set Consumer actor. Click here to access the LCSD Simulator. The LCSD simulator is developed in conformance with the IHE technical framework, that means that national extensions are not (yet) taken into account. This simulator can be an Initiator and a Responder. As an initiator, this simulator is aimed to send messages to a responder. So, if your system is ready to listen and accessible from the Internet, you will be able to send some messages to it. As a Responder, this simulator is aimed to listen messages from an initiator. The table below gathers the supported affinity domains, transactions and SUT actors. What is this simulator able to do ? The simulator has been developed with the purpose of helping the developers of actors, such as the Code Set Master and the Code Set Consumer actors. We have tried to manage most of the use cases, and most of message defined in the technical framework for those actors are supported by the simulator. The following table summarize the actors, profiles and transactions supported by the LCSD simulator. Today the simulator supports all type of messages defined in the TF for the LCSD profile, except the batch option for which further development is required. If your system acts as an HL7 responder in one of the transactions offered by the simulator (for example your system is Code Set Consumer and supports LAB-51 transaction), you will have to enter its configuration in the application. Before sending messages to your system under test, ensure that your firewall options give to LCSD Simulator the access to your system. The CSM Simulator allows the users of the simulator to send Code Sets to CSC actors. The CSM simulator provides some sample Code Sets (at least one for each message type that can be used to feed client Code Set Consumer. In this case, the CSM Simulator acts as an initiator and the CSC SUT as a responder. To communicate with your system under test, the simulator needs your system's endpoint configuration. The CSC actor acts as a Go to the LCSD Simulator: How to get started part of this tutorial for further details. First at all, go to LCSD Simulator menu bar and select the CSM menu entry. A sequence Diagram Picture is available to help you to understand the transaction and the role of each actors. 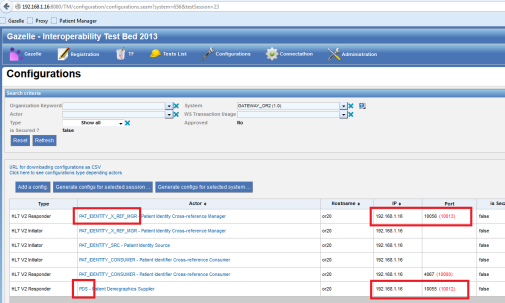 Choose your SUT configuration in the System Under Test drop-down list. You must choose the Codes to send to the CSC. Begin to choose the Code Set Category in the drop-down list, then choose the Code Sets in the Code Sets drop-down list. Use the button to display the selected codes. (The screeshot below illustrates this part). At least, hit the Send message button to send the selected codes to the CSC SUT. A tab with all messages for the transaction and the actor selected is available at the bottom. You can find your messages in using the filter fields. You can display the codes send in each HL7 messages. To do that, just hit the buton in the action column. A new window will appear to display all codes contained in the selected HL7 message and send by the CSM actor. For further details about this functionnality of the LCSD Simulator, go to the HL7 messages validation page. The simulator can act as a Code Set Consumer and receive messages from a distant system that implements the Code Set Master actor. First at all, go to LCSD Simulator menu bar and select the CSC menu entry. Below this picture, a tab with all messages for the transaction and the actor selected is available. You can find your messages in using the filter fields. Don't forget to refresh this messages list after to have send your message to the Simulator. To do that, only hit the "Refresh List" buttom. The CSC Simulator is a responder and is able to respond to your CSM SUT with the appropriate Acknowledgment message. If the CSM message send to the CSC Simulator is not consistent with the IHE technical framework, the CSC will respond with an error Acknowledgment. The HPD Simulator tool is developed in conformance with the IHE technical framework, that means that national extensions are not taken into account. This simulator is expected to act as an initiator or as a responder depending on the emulated actors. As an initiator, this simulator is aimed to send messages to a responder. Consequently, if your system (named SUT or System Under Test) is ready to listen to a SOAP request and reachable from the Internet, you will be able to received messages from the simulator. This simulator has been developed with the purpose of helping developers of IHE systems to test their systems with another IHE compliant system off connectathon periods. We try to manage most of the cases, that means that, step by step, we planned to offer you all the features defined in the technical framework. We also plan to implement national extensions if requested by the different organizations. Nevertheless, this tool is not a reference implementation. In order to send messages to your system under test, the HPD Simulator tool needs to know the location of the web service endpoint of your system. This configuration has to be stored in the database of the application, so that you can re-use this configuration without creating it each time you need to perform a test. 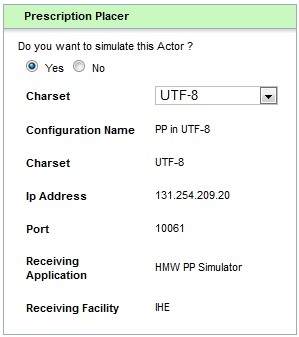 In order to proceed to configure the HPD Simulator, go to "SUT Configuration" and hit the "Create a new configuration" button. You can also copy or edit an existing configuration (one of yours !). The HPD Simulator embeds the validation service for checking the conformance of DSMLv2 messages exchanged in the context of the HPD profile. For each received and sent messages, you can ask the simulator to validate the messages. Below is the meaning of the different icons you can meet in the Test Report section of each page or under the Messages menu (gathers all the messages received and sent by the simulator). 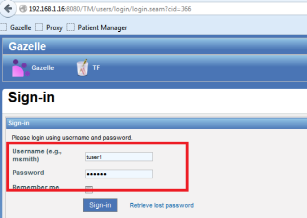 The Provider Information Consumer part of the tool is able to send DSMLv2 messages to query for healthcare providers. To start, you will need to regiser your system under test as a HPD Provider Information Directory actor. To do so, go to SUT Configuration from the top menu bar and hit the “create a new configuration” button. Fill out the displayed form. Be aware that the URL you provide must be reachable by the tool (do not use private IP address nor host names). Then, go to Simulators → Provider Information Consumer. On that page, first select your system under test in the drop-down list and ensure that the connection information are correct. Set the filter in the second panel. You can add assertions by dropping the boxes from left to right. Populate the required fields (marked with a red *) before adding another assertion. If you want to restrain the content of the response to a sub set of attributes, open the “Expected attributes selection” panel and select all the attributes one by one. Note that the tool has been populated with the list of object classes and attributes which might be known by the LDAP directory, this will help you with building your queries. When you have all your search requests ready, hit the “Send request” button. The response is stored in the database and parsed by the tool. 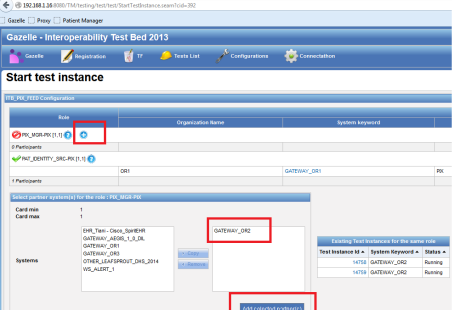 If its contains entries, their content will be displayed below the test report. The latter contains the messages sent and received which can be validated by calling the Gazelle HPD validation service (hit the green button). Finally, a button invite you to perform another query. You will be able to either start a new message from scratch or to reuse the previous message. When your message contains several searchRequest elements, you can edit or delete them using the icons on the right-hand of each message (under Batch Request). We did not implement our own LDAP directory but make use of the ApacheDS open source tool which supports LDAP3 and DSMLv2 queries. Nevertheless, we have implemented the web service part of the Provider Information Directory as stated in the IHE Technical Framework. 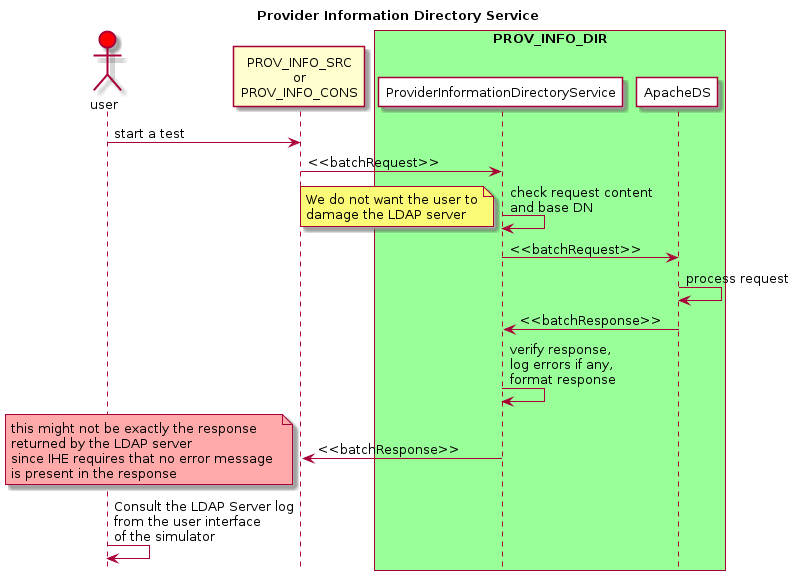 The Provider Information Directory Service is a front-end to the LDAP server configured as described in the first section of this document. The body part of the SOAP message is analysed and forwarded to ApacheDS through its DSML connector. The received request may raise errors in ApacheDS which will be reported in the batchResponse returned by the tool; in that case, the error is stored in our database and the response is formatted to fit IHE requirements (no error message are sent back to the sender). To verify that his/her query does not raise errors in the LDAP server, the user will be allowed to browse the logs under Simulators → Provider Information Directory → LDAP Server error logs. How to configure the LDAP Server (ApacheDS) and how to link the simulator and ApacheDS is explained in the Installation & Configuration manual of the tool and these actions shall only be performed by an administrator of the tool. If you feel like something is missing or goes wrong, feel free to contact the administator od the tool. To better explain the workflow triggered by a call to the Provider Information Directory Service, a sequence diagram has been generated, see below. The Provider Information Source part of the tool is able to send DSMLv2 messages to feed the provider information directory. Then, go to Simulators → Provider Information Source. This page gathers the capabilities of the various actors emulated by Gazelle platform along with the link to their configuration information. 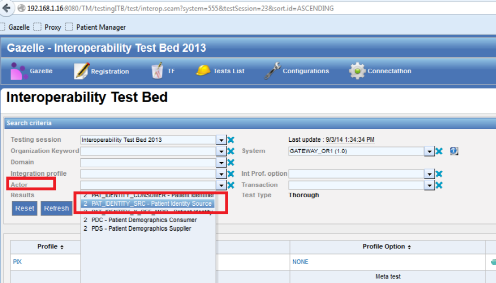 This document captures the list of steps needed to execute an ITB test using the Patient Manager (simulator) application. 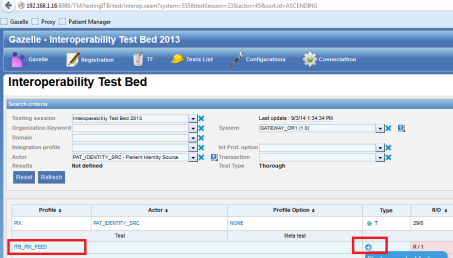 For ITB Test Execution, we will be using two PatientManager instances, each deployed on a different server. These systems will be configured as GATEWAY_OR1 and GATEWAY_OR2 in Gazelle TM. This will be the initiating SUT that will submit the PIX Feed. This instance of PatientManager cannot be deployed on same server as Gazelle Proxy. The responding SUT will be the PIX Manager. This instance of PatientManager can be deployed alongside Gazelle TM and Gazelle Proxy (but does not have to be). 1.1 On the responding PatientManager instance deployed on Server B, click on “Administration / HL7 Responders’ configuration” menu link. 1.2 Verify that PDQ and PIX Manager actor IP addresses and ports are configured as highlighted below. These are the default ports in Patient Manager for these actors. The IP address of 127.0.0.1 means that these actors are running locally which is correct. If these values are different for you, you’ll need to edit these rows to match these values. On this screen, it’s ok to use the loopback address (127.0.0.1). 2.1 On Server B, log into Gazelle TM using the admin credentials. 2.2 Click on the “Configurations / All Configurations” menu item. 2.3 Filter for “GATEWAY_OR2” in the system dropdown. GATEWAY_OR2 will be the responding PatientManager on Server B. 2.4 Verify that the IP address and ports in black font match the values from this step 1.2 Note that it’s best to use the actual IP address of the machine where the responding Patient Manager is installed (Server B) and not the loopback address (127.0.0.1). You can focus on the rows highlighted in red. Ignore the other rows. If the ports or IP addresses are incorrect then edit the row. Note that after editing the row, the proxy ports (in red font) will likely change dynamically. Take a snapshot of your screen after you’ve made your edits as you’ll need the IP address and Proxy port (red) for later steps. 2.4.1 As admin user, click on “Administration / Manage / Configurations / Manage hosts’ configurations” menu item. 2.4.3 Change the IP address to the actual IP address of Server B. Do not use loopback address (127.0.0.1). Click on Save. Follow steps 2.4.1 – 2.4.3 for OR1 system. This time you would be changing the IP address to IP address of Server A. 3.1 Log out of Gazelle and log back in as tuser1/tuser1. This is the user representing the organization in control of GATEWAY_OR1. 3.8. Leave your current browser window and open a new browser window for the rest of the steps. 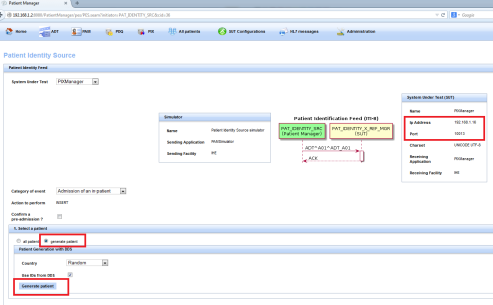 4.1 On the initiating Patient Manager instance installed on Server A, click on “SUT Configurations” menu link. Verify that the IP address and ports match the values from step 2.4 i.e. the IP address of the Server B (where the Proxy is installed) and the Proxy ports waiting for messages to be intercepted and forwarded to responding Patient Manager. The ports on this step need to match the Proxy ports (in red) in step 2.4 and NOT the ports in black font. If they don’t match, then click on Edit button and correct them. 4.4. Verify that the IP address and port matches the IP address and Proxy Port (red) values from step 2.4 for PIX Manager. Then click on “generate patient” radio button. Then click on “Generate patient” button. 4.6. Click on the “Send” button.